Grades 1 – 3. This huge assortment of bills and coins is perfect for helping students learn how to work with money, learn place value and decimals. 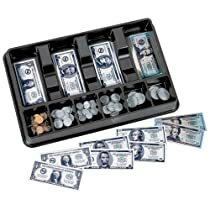 Kit contains a money tray with a total of 94 coins with each coin having the following: 30 pennies, 20 nickels, 20 dimes, 20 quarters and 4 half-dollars. Each dollar bill (ones, fives, tens, twenties) has 100 pieces.